See reviews of Neil Young & The International Harvesters "A Treasure" and Tech Notes: Preview Video of Neil Young's New Album "A Treasure". Also, see Neil Young's Photo Gallery Interview on the International Harvesters and The Making of A Treasure: Interviews with Neil Young. As we learned yesterday, the new Neil Young album A Treasure is coming soon. Neil Young will release a brand-new album, entitled A Treasure,on June 14th, on Reprise Records. It will be available in stores on CD and Blu-ray, as well as on iTunes and through all participating digital retailers. The limited-edition vinyl pressing will precede the CD street date, hitting shelves on May 24th, and will be pressed on 180-gram double-disc vinyl featuring special artwork etched into the fourth side. The vinyl edition will be sold through the official NeilYoung.com store and participating Record Store Day Independent Music Retailers only. Digital buyers should note that iTunes, Amazon and all other digital retail outlets will launch a pre-order on April 12th. Fans can also look forward to a full line of brand-new exclusive merch plus Le Noise tour items and Archives-related goodies, which will launch in the Neil Young Online Store in April. In the coming days Neil Young, Shakey Pictures and the NYA team will be providing this site with information on the much anticipated release of A Treasure. This record, which is #9 in the NYAPS series is very special to us on the archives team on so many levels. We aren't salesmen nor marketing suits, but rather production folk who love the music we work with. IMHO, this is one hell of a record that captures spot on key performances by the International Harvesters in concert. Much work has gone into the review of the this band's body of work and while this could have easily been a 2 or 3 disc set, the archives team has distilled the Harvesters down to 12 essential and potent tracks. Last week the serendipity of the ever unfolding tapestry of now brought to the Web a leak of the 14 minute promotional film that Neil made to explain a Treasure. It is titled 'Tech Notes'. This film was pulled from distribution with the cooperation of the fan base and Rust community, but will go live to the world in the coming days on this site. We will bring Tech Notes to you to watch, share, download, upload and view on your mobile devices. Ben Keith called this record ' A Treasure'. More details coming. Stay tuned! Pier 84 and Berkeley were very good audience tapes as well. I also wanted to point out that on the old ABD2K set, it was the same version of Nothing Is Perfect from the Minnesota State Fair that was used. I guess Mike and Neil had the same idea on the "best" version for that one (Mike also used Grey Riders from that show on his compilation). Would've loved to see Interstate on here, but excited Southern Pacific will see it's shine. Thank you Thrasher and thank you readers and fans. There will be more information on this record coming soon. Very excited to see that vinyl-buyers will get a little head start on the fun! I love nothing more than getting updates on a future Neil release -- can't wait to finally see this "Tech Notes" video. "A Treasure" should be a great way to kick off the summer. Thanks Archives Guy for all the intel. 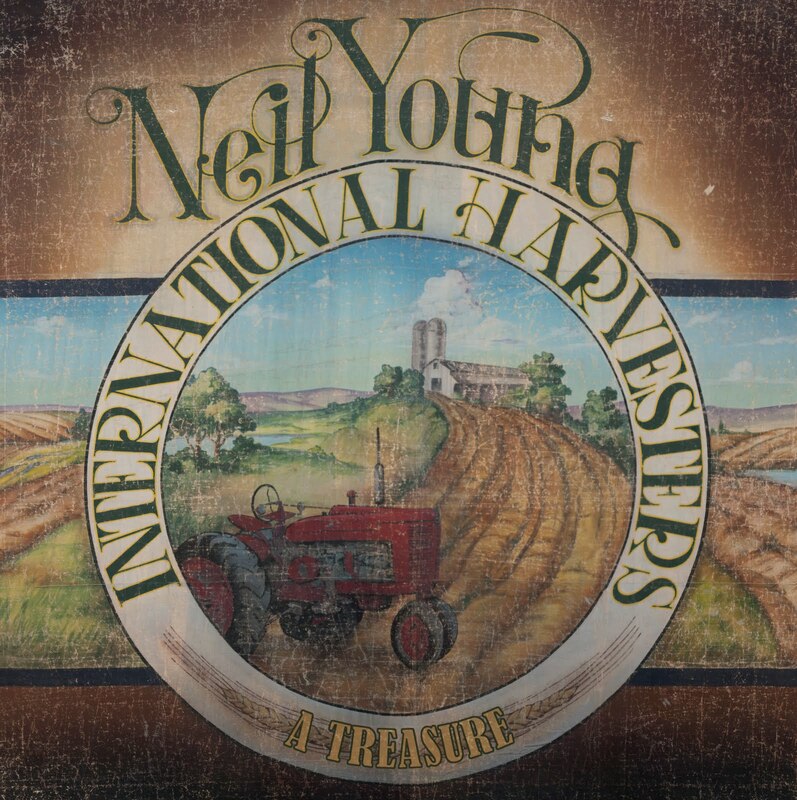 I have always felt the International Harvesters to be Neil's most versatile lineup. The arrangements of the classic tunes I have heard had some extra groove in them which made for some extra vibes in the listening, and the country sound was straight from the heart, soul and fields of Neil's emotions and experiences. Powderfinger, DBTR, Helpless, etc. all shined shined shined in these recordings, though they were not the only ones. This will be fun. Wow looks great. Vinyl for me definately. Hope it comes with a download code. AG - is it the Record Store Day retailers world wide? What happened to Toast? Trunk Show? Archives Guy?? I really really want that vinyl ! This sounds like it is going to be something really special. We still have Toast and Trunk Show, but aren't putting those out right now. You might be seeing the latter showing up at film festivals again. Whatever the case, it will be great to gte the vinyl. Thanks AG and Thrasher ! Not sure if anyone else has reported this but Trunk Show has been playing on Superchannel for about 1 week. I also heard that it is available in Torrents and has had frequent downloads. Archives Guy - Best to release it to the fans on DVD and Blu-Ray ASAP before everyone finds alternative means of seeing it. I guess that Neil Young still believes in The Archives.Toast has too much unreleased material(alternate and unreleased versions). His separate release could "cripple" an Archive volume. So a stand alone release should be examined and planned carefully. This is fantastic news, just can't wait to hear this beauty. Hope too for a superb BD edition full of tremendous images. And about Trunk Show, the response from Archives Guy: "You might be seeing the latter showing up at film festivals again." Personnaly i've never seen a festival or a theater who have the movie here in France. But i still hope ! Anyway Archives Guy, as usual thank you for taking the time to speak to us and give informations. Thanks for all the info. I'm sure I speak for most everyone when I say how thankful we are to have "official representation" from the Neil crew. For my part, I am looking forward to the vinyl and CD/BD combo of A Treasure. My brother and I have our tickets for both nights in Chicago, will compliment our both nights in Nashville last year! I would guess (and far be it from me to have any idea what's in the pipeline) that things like "Interstate" and even the ACL "Down By The River" may show up on a disc in Archives Volume 3. I've always enjoyed hearing Crawford doing back up vocals with Neil. He's subtle, smooth, and not over bearing. He brings out the finer qualities of Neil's singing the same way Emmylous, Linda R, Danny W. and Nicolette did. Great line up of musicians. Ok, you can't put out every song of every tour. But why so much selection? The meaning of an "archive" project is to release documents of the past as complete as possible. So for example Massey Hall was enough complete, with the 90% of the material. But not Dreamin' Man and Treasure: maybe less than the 50% of the tour material (new & old songs). I love what you're doing and what I'm listening (so thanks anyway :)) but I don't agree and understand this "distillation". Two words back at ya, "Southern Pacific." There's been a concert video on youtube for a few years of Neil performing this song live that should go down in music history. Tell me if Neil's heart isn't into this song. It looks like his heart if very much into it to me. Just a followup on the Tech Notes video we posted yesterday. We had quite a reaction to the video and saw quite a surge in normal traffic levels at Thrasher's Wheat. Thanks for all the comments & feedback! Again, apologies for the early posting on Wed night. The mixups were on the TW end as we were juggling a bunch of stuff and crossed some wires. It's really great after all the hoopla surrounding the Tech Notes video that this is finally out there. Seeing Neil in all of his ragged glory is always a treat. And thanks to Archives Guy and the folks at Shakey Pictures for letting us be part of the Treasure rollout by providing TW exclusives. Quite an honor and somewhat unique for a fan based blog. It's an exciting time to be a Neil fan and we're all awaiting a busy spring with solo shows, Buffalo Springfield tour, Treasure Bluray, and who knows what else?! Not seeing the pre-order anywhere on Amazon. Although it's impossible to see anything beyond that foolish, ginormous Kindle front page ad they have up right now. And my local indie shop can't find anything regarding a vinyl pre-order for me either....what's up AG? You can order the 2LP, or the 2LP w/ a t-shirt. Either order comes with a Le Noise "flip-book." However, this pre-order page says that the vinyl will be released June 7th, not May 24th. Maybe that's a mistake??? Was ' Nothing is Perfect ' not on the Live Aid Album - I'm sure it was . . .
$49.95 for vinyl? I know it's 2 LPs, but is that really justifiable? I'm a long-time Neil fan and I prefer vinyl but I'm just ordinary people! Trunk Show already damnit or at least take down the official website with the teaser trailer and the 5 star reviews. What's the point? "Hey, look at this awesome movie you might never see"? Kind of cruel if you ask me. No pre-order on Amazon for the CD/BluRay package as promised. Also, where are these Archives related "goodies" coming in April? It's April 28! I'm disappointed that none of the songs performed when Neil and the Harvesters played the Opry House in Nashville on that tour are included- I was at that show, and it would be great to hear something from it again! Oh well, such is life.